I stopped wearing nail polish about a decade ago because of my concerns about toxins, so I was mega-excited to finally find a safe, all natural alternative to allow me to wear nail polish again: Play Love Laugh Nail Polish by Hugo Naturals. 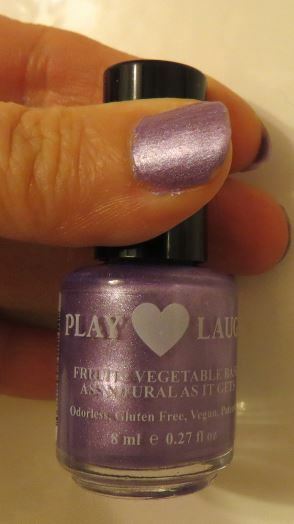 Play Love Laugh Nail Polish is all natural, so there are no nasty fumes or odors, and best yet: it dries fast! This means you won’t accidentally smear or dent your fastidiously applied nail polish mere moments after application. Two coats will last for about 5 to 7 days. Touch-ups extend the life of the polish even longer. Can you believe it–long wearing, quick drying nail polish that is made out of fruits, vegetables, and other natural ingredients? Once you start using this polish, you won’t want to go back to others ever again. Right now there are 12 fashionable and fun Play Love Laugh Nail Polish colors to choose from; I went for Sweet Purple, which is a blue-based lavender embedded with tiny, delicate sparkles. It’s a great color for any spring nail polish wardrobe–so cheerful! I received many compliments when wearing this polish, even from guys who don’t normally notice when I make a change to my appearance. If you are the type of person who wants to match your nails to your outfits daily, this polish peels off after soaking in warm water. It slips off easily without damaging your nail bed. This allows you to wear a different shade every day without harming your nails. You also save money because you don’t have to buy a separate polish remover. Play Love Laugh Nail Polish is safe for use by children and pregnant women; it is even safe to use on pets. It is gluten-free, noncarcinogenic and vegan, and it is made here in the USA. There are no alcohols or acetones. This nail polish is worry-free and eco-friendly. It was invented by a mother of small children who wanted a non-toxic nail polish alternative her kids could use. If your child applies the polish in a messy way, you can simply tidy it up by peeling off any polish that gets onto the skin. Available colors include several shades of pink, a pastel yellow, a light green, and a few blues–gorgeous colors for spring.